This week it was time to have our hedges and verges cut. As we drove back home down the lane, I commented to Wendy how much better they looked, but mentioned that I needed to get the ditch along the hedgerow cleared out to complete the job – I’ll come back to that little task later. There was me thinking that the weather had turned for the better, but in fact it all started going down hill mid-week when we got an unexpected covering of snow, which thankfully didn’t last and thawed quickly. Unfortunately that also meant that the ground was once again sodden and so when the rain starting falling the next day, I wasn’t a happy bunny. It rained all night and the next morning I was due to go shopping with Wendy but at the last minute decided that I would stay at home to check if the new drainage pipes were working. To be honest, at the time I really didn’t fancy wandering aimlessly up and down the supermarket aisles anyway and so it was a bit of an excuse to get out of going. As it happened it turned out to be one of my better decisions. Not long after Wendy left the water was flowing well through the new pipes and ditch, but the lake in the field was once again returning. I was confused and couldn’t understand why this was happening. As the levels rose I decided to once again go and annoy our neighbours and borrow their pump, just to keep the water away from the new teashop as we didn’t want the tide in there a second time, or I really would be for the high jump. Our neighbour had loaned their pump out and so went to retrieve it whilst I went home to check on things. On my return I could see that the water level was noticeably higher and was running from the outside ditch like a river down through the garden. I grabbed the leaf rake and pulled out some branches from the main ditch along the hedge, thinking they could have blocked the pipe, but that didn’t help any. 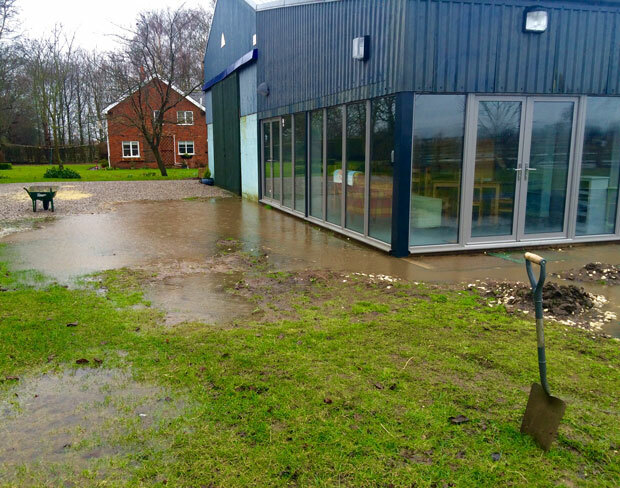 Thinking quickly – I had to stop that water rising – I grabbed my shovel and shifted barrow loads of soil to dam up all the edges, in an attempt to stem the tide. Eventually, the water was held back, less than an inch away from once again entering our new building. At that moment Steven and Emma, our neighbours arrived with the pump and quickly got down to start shifting our rather large water feature. Emma then grabbed the leaf rake and went to check if anything was blocking the outside pipe, as I had. After checking the flow at the other end of the pipe we could see that in fact something must be blocking it. With the rake not making much headway, I took off my coat and jumped into the ditch, up to my armpits (wow, was it cold!) and then eventually found the pipe end and removed the blockage. Bits of hawthorn branch from the newly cut hedge had, under pressure from the water created a plug in the pipe end, ensuring the water was going nowhere fast. With the plug removed the lake soon disappeared and guess which ditch is getting cleared out today, by another of our fantastic neighbours and his digger. We are lucky to have such help in times of crisis.